When the high-definition re-release of Final Fantasy X hits the PlayStation 3, it will include an additional title, Final Fantasy X-2. That news comes courtesy of Japan's wildly popular Jump magazine (courtesy the translations of the reliable Nipponophiles at Siliconera). 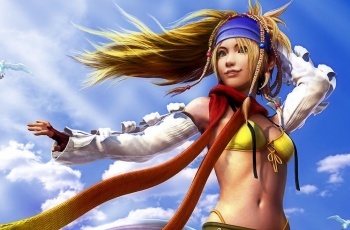 According to the original piece, both Final Fantasy X and Final Fantasy X-2 will be based on their more feature-rich International Edition iterations, and most crucially, each will feature improved HD graphics designed to make both games more palatable on modern HDTVs. Further, Jump claims that owners of Sony's Vita handheld will also see access to the two HD re-releases, though instead of appearing on a single disc as with the PlayStation 3 version, each game will be sold separately. There's currently no official release date for these games, nor any notion of how much they might cost (either as a set on the PS3 or as individual titles on the Vita), though if history is anything to go by we'd expect the PS3 game to be priced right around $40 -- less than a brand new, big budget game, yet more than your typical PlayStation Network release. Individual pricing on the Vita may not directly mirror the costs associated with the PlayStation 3 release, but again, we're speculating here. Obviously fans should be excited by this news, but we caution you not to get too psyched for this release. Being a Japanese magazine, it's entirely possible that Jump's report only applies to that country. We'd be very surprised to hear that publisher Square Enix would alter this arrangement for the American release of Final Fantasy X HD (especially as the vast majority of the necessary localization work has already been completed) but stranger things have happened and we won't truly know what the company has planned until it officially confirms this idea one way or the other.